“In school, you’re taught a lesson and then given a test. in this quote has been my experience. Has it been true for you? it’s a good place to find some ideas. are things that weren’t always part of who I am. I have a quiet and gentle spirit. I can forgive and not hold a grudge. I am open to new ideas and new ways of looking at things. I have learned from the past live in the present and look forward to the future. 1 and 2 are gifts I have been given. 3 came from the realization that life is funny even the hard parts. 4, well, life would be dull if the only person I listened to was myself. I am not talking about famous people or those who everyone remembers. I am referring to people who are unforgettable to me personally. Like a teacher, client, co-worker, neighbor, friend, a family member, occasionally a stranger. People who had an impact on my life. With most of the “unforgettables” in my life the encounters have been good. A few of them were not especially pleasant. But good or bad I have learned lessons from all of them. They come to mind at the most unexpected times and often in unusual places. There is always a reason for remembering them and it is always a treat. Well, not so much a treat with the bad ones but I don’t dwell on them. but sometimes they do sneak in…they are unforgettable after all. Today, I think no one would ever forget this kitty. Finding my word for the year. Every year I have a word for the year. It is a spiritual thing. I am given a word and usually a scripture with the word in it and I spend time throughout the year thinking about, studying, praying, and meditating on the word. When I say I am given a word, or sometimes a phrase, I don’t mean it is given to me in an eerie or metaphysical way. Sometimes it comes to me from something I read or something someone says that resonates or I see something that stops me and makes me take notice. However I get the word it is always a surprise. In the past some of my words have been, boundaries, seek, wait, and courage. Usually I start getting a feeling for the word in the fall and by this time I know what it will be for the coming year. But so far this year…nothing. Not even a whisper or hint. I don’t know why this year is different. But I do know there will be a word. I feel a sort of stirring or shifting within, change. There is a sense of excitement brewing. What is ahead for me to learn and experience through this word? But also a sense of wariness. Maybe the lessons of the past words were to prepare me for more difficult lessons? Lessons that are more challenging? Lessons that I thought I had learned but haven’t? Lessons that I have avoided because they are difficult or will hurt while learning them? Whatever the word is for 2013 I think it is going to be a different experience than in past years. Is he not the cutest thing? Ok, maybe not puppies and kittens and baby cute. But in his own uniqueness he is cute. Really, just look at him, or maybe he’s a her, whatever. Cat-like eyes, head held high, a headdress that is regal. Could be a Flamenco dancer with that fan on his back. Or maybe it is a toreador’s cape. Has a knife as a tail, just in case he has to protect himself or his lady’s honor. Then notice his feet. How can you not notice them; are they not grand? And his toes. Remarkable! The best thing about this creature is that he looks like he is quite happy being a lizard. Actually, I think he looks proud to be who he is, or what he is, whichever, doesn’t matter. The fact is he is an amazing creature. Today, I think this creature has something to teach me..
Today, I am thankful for all the teachers in my life and the many lessons they taught. The picture of the creature: Copyright General Board of Discipleship. http://www.GBOD.org Used by permission. When I was a little girl my Granma Lil taught me to crochet. It was a very frustrating endeavor for both of us. But we persevered and eventually, like years later, I came to love crocheting. I have made many many many afghans and baby blankets and booties and baby sweaters and slippers and place mats and hats and…just lots of stuff. Some I make for me but most for others. The recipients of these items seem to think I have done some great thing for them when in reality it is a selfish thing that I do. You see I love to crochet and I love seeing their faces when they open the package. Oh, and I love the fact they think I am so smart and talented. Got em all fooled. The truth is if they spent as many hours as I have with yarn and crochet hook they would be just as successful with the tools. 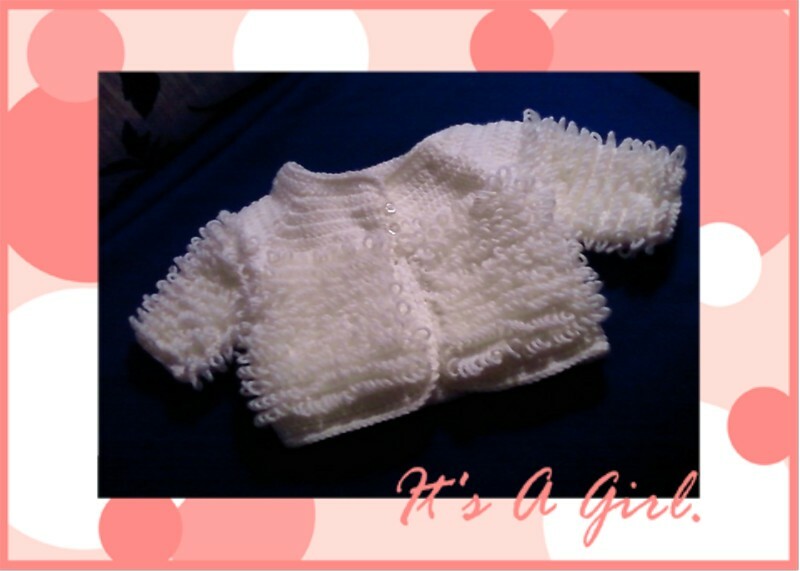 A friend is soon to have her first grandchild and so I made my favorite baby sweater to welcome the little girl. Today, I am thankful for a Granma who had the patience to spend a whole summer teaching me to crochet. It was a wonderful gift and one I have been blessed to share with others.